From the time they were introduced to the world at WWDC 2013, beacons have been generating buzz. According to ABI Research, there already are more than a million beacons in the marketplace and, this number is projected to blow past 400 million within the next five years. Not surprising, given the explosive growth in hyperlocal based services of late. Though, location-based marketing has been one of mobile’s promises since the beginning, it has taken years for the necessary infrastructure to be put in place at scale and for marketers to gain an understanding of how to craft contextual communications. According to research by Cisco, about 52% of mobile ad spending, or $10.8B will be associated with location-targeted campaigns by 2017. At the same time, while beacons were initially referred to as a “retail-first” opportunity, of late, these proximity detection devices have cast their spell on businesses across various verticals, right from hotels and events to stadiums and more. Though there is a lot of hype around beacons, most marketers even today aren’t very clear about what all beacons offer or how they could leverage beacons to offer enhanced services without driving away their customers with irrelevant ads or offers. If you have an idea for a beacon project and are busy trying to figure out where to begin with or how to come up with a roadmap for your pilot or plan your budget, you should consider checking out our recent webinar on ‘Your Guide to Planning a Successful Beacon Pilot’. It will help you understand the nuances of setting up a beacon pilot from scratch. In this blog we will discuss in detail about 5 primary reasons why businesses of all sizes, across various verticals are busy investing in iBeacon technology. Today it has become increasingly critical for retailers and brands to be able to meet today’s hyper-connected consumers on their terms, across all channels of interaction, by serving their ever changing needs, preferences and in-store behaviours. At the same time, it is equally important for marketers to know exactly what kind of offers is their business sensitive to. For example, an airline might be more sensitive to real-time offers based on time-of-day , considering airfares change so frequently, than to social context as a business driver. On the other hand a CPG (consumer-packaged-goods) brand might be more sensitive to social context, but less so to time-based offers. If your business is sensitive to time-based offers, social relevance, weather, mobile usage, or the geolocation of your users, then leveraging beacons for real-time contextual marketing could help you offer enhanced services. For example, Clorox, a CPG company recently launched an iBeacon campaign that allowed its Hidden Valley Ranch and Soy Vay brands to engage shoppers with quick hacks for dinner. As a part of this campaign, the CPG brand has leveraged geo-fencing to message users of the List Ease and CheckPoints apps. Users will receive push notifications when they are in-store, encouraging them to swipe for an easy dinner solution and drive them to the location of Hidden Valley and Soy Vay products in the store. Thus, by reaching out to consumers in apps that they are already using for shopping, Clorox is attempting to be less disruptive by engaging users when they are already in the shopping mindset. Be it relevant app suggestions in the app store or product recommendations on Amazon.com, personalization is calling the shots in the digital world. According to a recent survey by Accenture, nearly 60% of U.S consumers agreed that they want a more personalized shopping experience with real-time promotions and offers. This is exactly what beacons are helping businesses achieve. This brings to one’s mind the question around how are fitting beacons on 500 London buses and 4000 black cabs adding on to this perspective, as reported by the Drum. To be quite frank this method of merely pushing offers without referring to any particular customer data such as customer movements and purchase history, will only result in users being bombarded with irrelevant push notifications. This can then nudge consumers to stop using an app or uninstall the app altogether. In fact, one big differentiator between beacons and RFID is that beacons are far more private because it gives users control of the apps that leverage the beacon. What is the point if apps resort to aggressively bombard users with ads or offers once user permission is granted? Fortunately there is answer to this – enforcing more nuanced guidelines that align the interests of retail brands with those of their consumers and ensure that both parties benefit from personal data collection. We have discussed about these in detail in our blog on how retailers can earn consumer trust. Being a hardware that is low in terms of both cost of investment and power required, beacons are very cost effective. Adding on to that, these proximity detection devices support a range of around 50 to 70 meters. Another important thing to note here is that, rather than going ahead with a full-fledged beacon deployment plan, it is always a good practice to start with a small pilot, with a limited set of people, at say 3 to 5 locations and test for about 3 proof-of-concept use cases. Such a ‘closed’ and ‘limited’ project will only require about 10 beacons in total. Moreover, it will also help you understand the issues that come up during implementation of a beacon strategy, which parts of the strategy are easily scalable and which parts are not. Thus, there is not much investment involved in running a beacon pilot, given that a number of companies offer 3 such beacons for less than $100. Adding on to that, compared to other enterprise and marketing applications such as CRM, ERP etc, beacons avoid most of the hardware maintenance cost. Leveraging a beacon management platform such as Beaconstac allows brands to monitor status & health information for individual beacons such as battery level, temperature and signal strength at ease, rather than walking around the area of deployment with an app to check for such health alerts. Businesses are fast realizing the importance of big data and are investing huge amounts of time and money to gather it. Beacons on the other hand provide businesses with endless opportunities to collect massive amounts of untapped data, such as the number of beacon hits and customer dwell time at a particular location within a specified time and date range, busiest hours throughout the day or week etc. Such detailed insights into customer data equips businesses for impactful decision-making. For example, dwell time spent by a visitor at a particular location in a museum will help them identify if the exhibit is popular itself or if it’s because of the location at which it is placed. Adding on to that, the museum could also use this information to drive revenue by recommending items similar to the artefact, for purchase at the souvenir shop. An important thing to note here is that, while big data is usually associated with large firms, it does not mean that big data makes no sense for SMEs. In fact, with the advent of cloud computing, even medium sized companies can exploit rich forecasting and data representation by using beacons to capture and add data and further make the outcome more substantial. Once they are installed in the desired area of operation, beacons will start pushing messages and display ad content such as images and videos as soon as the user comes within the range of a beacon and remains in proximity for a predetermined time duration. Irrespective of the number of users who are in the range of the beacons at the same time, beacons can perform all proximity messaging tasks that have been assigned to them. In fact, for small scale deployments, businesses may choose to code beacon-triggered campaign logic into their mobile app’s source code. But as they scale up, for every new coupon or discount deal, it will not be possible to keep rolling out updates to their app on the app store. Choosing a software platform like Beaconstac for managing notification rules and measuring the effectiveness of your campaign through analytics is therefore crucial. 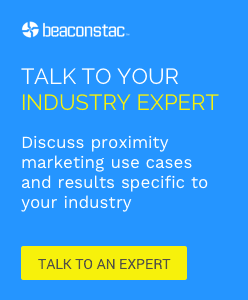 Want to learn more about the how brands can use beacons to their full potential? If you want to learn more about planning a beacon project, the kind of investment it involves, and how to run a successful beacon pilot, check out our recent webinar on ‘Your Guide to Planning a Successful Beacon Pilot’. It will set you up for success.